E.C. Manning Provincial Park | WANDERUNG! “Our team went to check out the area around the Three Brothers mountain. The timing was perfect for this trip. The meadows were snow-free and blooming with wild flowers. Thanks to the SW wind, the skies stayed smoke-free despite on the proximity of BC fires, although we did see some smoke on the horizon. Although the Heather Trail is the most popular route in the Manning park, it never felt too crowded, especially in the evening hours. However, due to the extremely dry weather, the portion of the trail from the parking lot to the First Brother junction was quite dusty. This might become a real issue on long weekends when more people hit the trail. Unfortunately, the Kicking Horse wilderness campground was full when we arrived, so that we ended up camping in a crowded overflow area. We still had a good time over there. 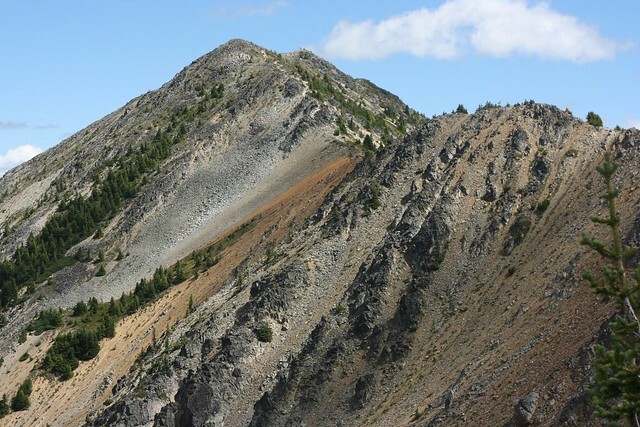 However, for late starters, it’s probably wiser to stay in the less popular Buckhorn campground half-way between the parking lot and the Brothers than take chances with the Kicking Horse. The views from the First and the Second Brother were quite spectacular, although not as dramatic as those from the ridges in the southern part of the park. Some of us also bushwhacked to the Fourth Brother; however, there was practically no visibility there because of dense fog. On the way back we stopped at the Lightning Lake for a good swim. That was a perfect way to complete the trip!